It’s not like Herzog is innocent of such self-serving devices. He’s not above directing his interview subjects to shape his film or, like Treadwell himself, doing multiple takes until he gets something that fits his design (we just don’t see Herzog’s outtakes). And Herzog turns his decision not to play the audio recording of Treadwell’s death (his video camera was on during the fatal grizzly attack but it recorded no image; the lens cap was on) into a piece of theater that exploits the very spectacle that he withholds. Herzog puts on the headphones and intently listens himself, the camera studiously recording his stony endurance, and then instructs the woman who owns the tape to “destroy this tape immediately.” But given that, this documentary-essay-Herzogian rumination is spellbinding because of Herzog’s perspective on Treadwell’s idealism and naiveté and need. 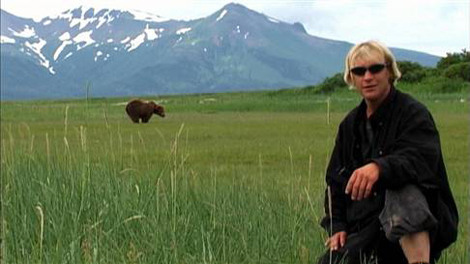 Timothy Treadwell’s quest was, however self-serving, sincere and passionately undertaken. Herzog professes respect and admiration for Treadwell in this portrait created largely from the archive of video Treadwell left behind. But as the portrait is filled in, it becomes apparent that Herzog is even more fascinated by his contradictions, his blind passion, and his inflated sense of privilege that justifies breaking the laws that he would hold everyone else to. Treadwell took his footage to schools and TV talk shows (Herzog includes a clip of Treadwell on Letterman) and spoke not just of the wilds but his unique connection to the land and to the animals and his efforts to protect them from hunters and from civilization. This self-appointed guardian talks a good story, yet his own footage shows him shrinking from a confrontation with a group of wildlife photographers as they lob stones at his beloved grizzlies to get a dramatic reaction for their nature shots. Treadwell merely records the event from his hiding place, moaning over the injustice but too timid to even cry “Stop!” to the otherwise unintimidating group. Herzog frames Treadwell’s footage (much of quite beautiful and majestic, with landscapes limned in fog and dense forests stretching forever that could be outtakes from Herzog’s own films) with his own trademark commentary and new interviews with those who knew Treadwell. They have often contradictory assessments but there’s one thing that everyone agrees upon (and his own footage seems to corroborate): more than simply protecting the grizzlies, Treadwell wanted to join their world, but on his own terms. He’s obsessed with winning their acceptance: the human friend to the wild bear, like he’s in a Disney cartoon. He coos to them like pets, reaches out to touch them, gives them childish names like Rowdy and Mr. Chocolate. As one Alaskan Native historian comments, Treadwell showed “the ultimate in disrespect to the bear” because he “crossed the boundary we have lived with for 7,000 years.” And Herzog agrees, if not in a spiritual sense then in a practical respect for and a healthy fear of the natural world. “I must disagree with Treadwell here,” Herzog interjects after one of Treadwell’s overexcited paeans to the natural wonder and spiritual purity of the grizzlies. “What haunts me is that, in all the faces of all the bears that Treadwell ever filmed, I discover no kinship, no understanding, no mercy. I see only the overwhelming indifference of nature.” It’s the same wild landscape, the same green world that Aguirre and Fitzcarraldo defied and were defeated by, but in place of an epic vision crushed by the hubris of man against the power of the natural world, it’s a deluded dreamer killed by the very creatures he vowed to save. The man who built himself up a martyred activist and eco-warrior ultimately made himself into one. Herzog isn’t quite sure if it’s tragic, ironic or the inevitable comeuppance for such presumption, but he’s fascinated by it and that fascination comes through every frame.